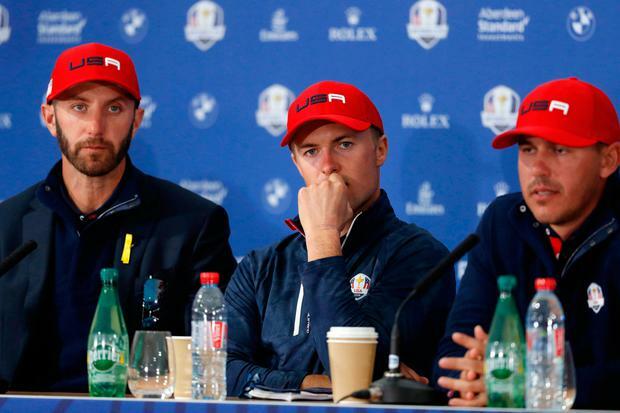 Anger among the United States team over their dismal Ryder Cup defeat boiled over in the post-match festivities when their two top-ranked players, Dustin Johnson and Brooks Koepka, had to be separated after a flare-up. So much for this new era of Stars and Stripes camaraderie. Witnesses recounted how the pair almost came to blows after they had been invited into the Europe team room, a few hours after the resounding home success at Le Golf National. The reason for the bust-up was not known, but it was a huge surprise as they are regarded as best friends. They played together in the Saturday afternoon foursomes, when they were beaten by Justin Rose and Henrik Stenson. They work out at a Florida gym together and their similar big-hitting styles earned them the nickname of the 'Bash Brothers'. How appropriate that seems now. Johnson's partner, Paulina Gretzky, prompted rumours of a rift between the pair when she deleted every picture of Koepka from her Instagram account. She was said to have been close by when the row erupted. One of the European players' wives also witnessed the incident, and an insider reported that she was "clearly shocked and upset by the nastiness, which was very threatening". The spat was not the only example of the US proving sore losers after their 17½-10½ humiliation. Patrick Reed took an almost unprecedented swipe at captain Jim Furyk and the "buddy system" at the Ryder Cup that he believes caters to a few select players. Reed, America's top scorer in the two previous Ryder Cups, was furious with Furyk for splitting up his successful partnership with Jordan Spieth, and benching him for both foursomes sessions. The man dubbed 'Captain America' was saddled with a jaded Tiger Woods, and lost both fourball matches before beating Tyrrell Hatton in the singles. He said: "I thought our captain might go back with the groups that have worked in the past. For somebody as successful in the Ryder Cup as I am, I don't think it's smart to sit me (out) twice. "The issue's obviously with Jordan not wanting to play with me. I don't have any issue with Jordan. "When it comes right down to it, I don't care if I like the person I'm paired with or if the person likes me, as long as it works and it sets up the team for success. He and I know how to make each other better. We know how to get the job done." The Masters champion admitted he was seething in the after-match press conference when Spieth intercepted a question about them not pairing up again, after they had lost just once in 12 previous matches together. Spieth deflected by saying his partnership with childhood friend Justin Thomas was a big success - and they won three of their four matches. "I was looking at him like I was about to light the room up like Phil Mickelson did in 2014," Reed said. It did not stop there. Reed's wife, Justine, became involved in a public argument with the Golf Channel commentary team. "He didn't hit many fairways on day two, but many didn't," she said. "He made sure he scrambled. First day, he made five birdies, and hit a ton of fairways - and sat the afternoon. This is where the hate comes from. "You must be living in La La Land! The Golf Channel are the ones that are unspeakably awful. Not even trying to hide their bias, their prejudice and their hatred. "They are journalistically disqualified. Have been for a long time. Now others can see it clearly as well. He was the leading point scorer for the last two Ryder Cups. You didn't see any of the others playing with Molinari and Fleetwood. Yet you change the most winning pairing in American history. "Patrick never said he didn't want to play with Jordan. Maybe you should ask Jordan why he didn't want to play with Patrick. You don't have to love the people you work with - but when you have chemistry and success, you go with it." Meanwhile, it was revealed that a Thomas T-shirt bearing the slogan 'Beat Europe' was a motivating tool for the Europe team. They set up a WhatsApp group and the Thomas image was the banner picture. Sergio Garcia said: "There was a fair bit spoken about the picture in the team room when we saw it, and we decided to post it on our private WhatsApp page as a permanent reminder.